Nearby Millennium Park you’ll discover a state-of-the-art collection of architecture and free concerts, exhibitions, tours, and family activities to compliment your Chicago private yacht rental aboard Adeline’s Sea Moose. With 25 acres of awe-inspiring landscape, breathtaking architecture and an iconic collection of public art, Millennium Park is Chicago’s premier green space. Millennium Park celebrated its 10th anniversary season in 2014 and continues to present dozens of free events and programs including art installations, outdoor concerts, films screenings, alfresco workouts and more. 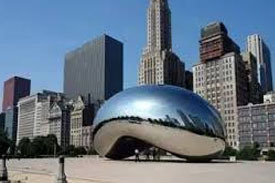 All year round, “The Bean” is an iconic draw for visitors and locals alike. Take a picture in front of Cloud Gate, the official name for the massive, stainless steel structure that’s become Chicago’s signature landmark. In its mirror-like surface you’ll see not only your own reflection but the downtown skyline. In the warmer months, spread out a blanket in front of the award-winning Pritzker Pavilion for a live performance. Cool off by splashing around in Millennium Park’s Crown Fountain, a shallow reflecting pool bookended by 50-foot towers.